The Department of Music's Conrad Prebys Concert Hall, Experimental Theater, and Recital Hall is located inside of the Conrad Prebys Music Center (CPMC). The Mandeville Auditorium is located in Mandeville Center. Music Center Studio (Studio A) is located in Warren Lecture Halls. Please click on the driving directions below to link to UC San Diego's Interactive West Campus map and search for Mandeville 285 or Warren Lecture Hall 625 depending on the event location. Parking lots are indicated with a letter "P" before the number. The Department of Music's Main Office, including the Undergraduate and Graduate Advising offices are on the first floor of Conrad Prebys Music Center. 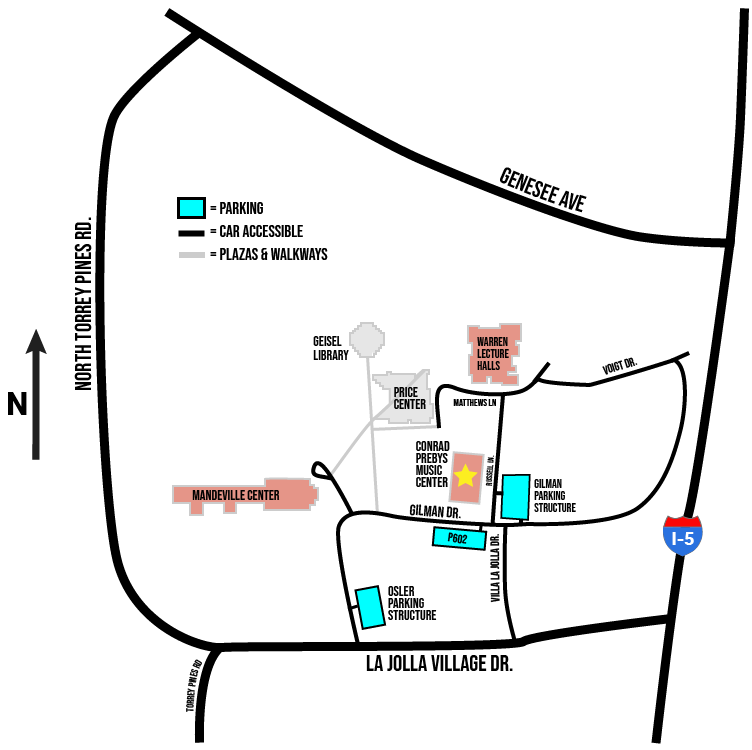 Gilman Parking Garage, Conrad Prebys Music Center parking, at the corner of Gilman Drive and La Jolla Village Drive, all spaces including visitor spaces. Parking on campus is free on Saturdays and Sundays. Please visit the Parking and Transportation site for up-to-date information on parking fees and policy.